Can you imagine going cycling in a layered, heavy, floor-length skirt without something going horribly wrong? Of course you’ll immediately think: “Why would I even do that? Just give me a pair of comfy leggings and get on with it.” Well, not an option if you happened to be a female cyclist living during the 1890s. So, if you wanted to ride on, you had to get cunning. Nowadays, we already know how cumbersome and impractical female conventional Victorian garments really were but any physical activity at that time made it even more obvious. Cycling became hugely popular among middle- and upper-class citizens in the late 19th century, men and women alike. And while the role of a bicycle in women’s rights and liberation has been (and still is) explained many times, less is known about the fashion-related struggles women had to face. The skin-tight button-up petticoats stifled the ribcage and the flowing skirts got caught in spokes and around pedals, resulting in many a serious injury. You might think that just hitching up the skirt or simply riding in one’s bloomers would solve the problem but it’s the 1890s we’re talking about. In the Victorian era, women were under scrutiny because of their apparel, which was supposed to reflect the highest moral standards – modesty and virtue. Many a woman encountered insults and even things thrown at her by onlookers who felt threatened by the sight of such a rebelling “dress reform”. Oftentimes, they rode in their full daily wear about town while later changing to more “radical” garments for less crowded areas to avoid harassment. But female cyclists didn’t plan on parting with their bikes so they got creative. The cyclewear problem became so mobilising for women that the mid-1890s era marked the entry of women into the world of patents. Thanks to female inventors who got their ideas down on paper and patented, we now know about clever concealed converting technologies inside skirts, including pulley-systems, gathering cords, button and loop mechanisms, and more. A dressmaker from Brixton, Alice Bygrave, filed a UK patent for “Improvements in Ladies’ Cycling Skirts” in 1895. Her system included a set of pulleys sewn into the front and rear seams of a skirt, which adjusted its length according to the wearer’s (societal) needs. This novelty became hugely popular in the UK and subsequently made its way to Canada, USA, Switzerland, and even Australia. Julia Gill, a court dressmaker from north London, registered her convertible cycling skirt in 1895. Her skirt was foldable upwards thank to a series of hidden rings and a cord into what Gills called the “semi-skirt”. 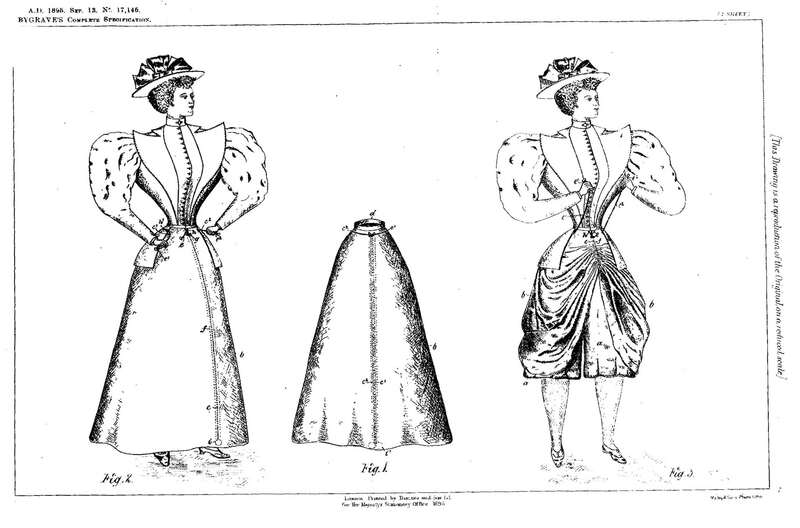 The inventor also recommended combining the skirt with some rather splendid “fluted or vertical frilled trowsers”. 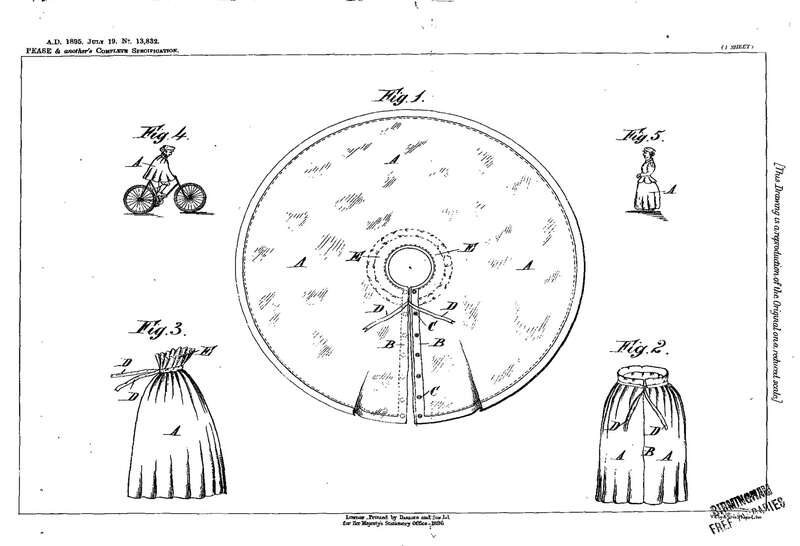 Mary and Sarah Pease, sisters from Yorkshire, submitted their patent for an “Improved Skirt, available also as a Cape for Lady Cyclists” in 1896 and it was exactly as described. This was one of the more radical designs of that time because the skirt came off the body completely and covered the woman’s body as a cape while pedalling. The most elaborate and unusual on our list has to be Henrietta Müller’s three-piece tailored suit patented in 1896. An intricate convertible design of an A-line skirt, a jacket, and an all-in-one undergarment combining a blouse and bloomers. The whole model could be comfortably adjusted by a system of loops and buttons and looked stylish no matter the occasion. And, as a complete novelty, it also came with pockets. There’s no denying that while primary concerns of these ingenious inventors were safety and comfort, the underlying issue was strongly political and was meant to drive societal changes and gender perceptions. It’s proof that a revolution doesn’t have to be shouted from the rooftops. Sometimes, it might be putting an awful lot of work into just not being seen I order to live one’s life in peace.